The colder weather has well and truly arrived and I for one am freezing! I really need to invest in a new, warm coat but until I get round to purchasing a new one for myself, I've giving all you lovely people the chance to win this gorgeous Bellfield Women's Wool Duffle Coat in Navy from MandM Direct, who have a whole host of stylish coats and jackets to keep you warm in these colder months of the year. I always think of my lovely readers! This is a prize worth £49.99 and I'm so sad that I can't keep it for myself as I love it, it just looks so cosy! I love the colour, faux fur triims and the embellishments on the front and buttons, it's fab! This giveaway is open to residents of Ireland, the UK and European Union only. 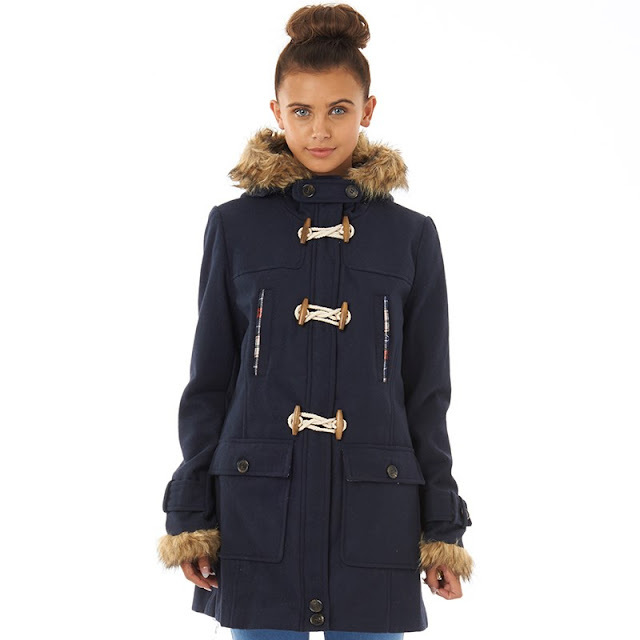 It shall run for two weeks and the winner will get a Bellfield Women's Wool Duffle Coat in Navy in a size of their choice. The prize will be posted directly from MandM Direct. To enter simply fill out the Rafflecopter below. Best of luck to everyone who enters! I love duffle coats - they are so warm and never seem to go out of fashion. Thank you for another lovely giveaway, Fiona! You are a star!